Hey Defenders! Thank you for coming to our classroom defender package area. Critter Squad Wildlife Defenders were doing classroom presentations well before our popular birthday parties. Our Critter Squad Wildlife Defender educator arrives to your school with some unforgettable animals to give your class the experience of a lifetime. We can tailor your classroom defender package to multiple themes to make sure you get all the fun and information you are looking for from our classroom defender packages. Check out all of our classroom defender packages below. Please review our menu below and be sure to call our main office at 818-654-9433 if you have any questions. DON’T FORGET ALL CHILDREN IN YOUR EVENT GET A FREE C.S. WILDLIFE DEFENDER GIFT! Some school customers look at our classroom defender packages above and say “that’s not enough for what we want to do. How can we do more?” Well, Critter Squad Wildlife Defenders has set up a few ways for you to combine the two main options in the “combining options” section of our classroom defender menu. Below you can see all the different options we have for combining options. Remember we do create quotes for any defender event, so call in to our main office if you do not see what you are looking for. The classroom themes below are the various styles you can have for your classroom defender package! Did you want a mixture of animals? Maybe all reptiles? Maybe it’s rainforest week and you are hoping to meet animals that come from the rainforest? Whatever it is, Critter Squad Wildlife Defenders can probably help. Here are some final ways for you to spice up your classroom defender presentation. Taken from some of our most popular defender party add-ons, you are able to go one step further and make sure your defenders have an unforgettable experience. Are our events outside of your budget? 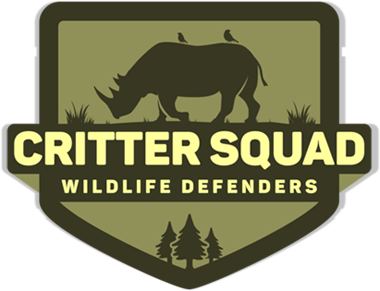 Blogging about Critter Squad Wildlife Defenders. Give parents this hand-out to help raise funds!